Arsenal legend Martin Keown has told Gunners manager Unai Emery the simple thing he must do to get Mesut Ozil back to his best form again this season. The Germany international has looked out of sorts for some time in a Gunners jersey, and also had a poor World Cup for his national team. It’s not been the easiest time for Ozil as he’s been on the receiving end of much criticism from pundits and media both in this country and back home. The 29-year-old’s confidence does seem low, and Keown believes it’s important for Emery to get him enjoying his football again as he doesn’t look like he has done for some time. ‘Emery must help Ozil as much as he possibly can to get him back enjoying his football,’ Keown told the Mail. 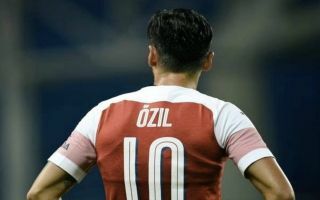 The former Arsenal defender is one of the names who’s been critical of Ozil on occasion, but it’s clear he’s aware of the talent Ozil possesses. With the club shaken by the big change of Arsene Wenger stepping down after 22 years as manager this summer, it’s vital for Emery to get players like Ozil firing again if he is to be a success at the Emirates Stadium.